It’s gull time in Old Town Hastings. But this year is different. There is a marked decrease in the number of gulls around. Previous years (search for “gulls” here to read previous posts) there have been several breeding pairs on nearby roofs. This year there looks to be just one pair but as no babies have been seen (some heard nearby but still not seen) it’s not clear if they’re breeding. Fewer gulls around means a quieter life for everyone else. The gulls are particularly vociferous, particularly as the breeding season gets into full swing. Also, there’s a noticeable increase in the population of magpies. These birds eat other birds babies, which prompts the question whether the presence of the magpies is contributing to the fewer gulls. Not an expert on this. So, I have no idea. In previous years, I publish here a series of photos chronicling the growth of baby gulls. The first photo this year is one taken by a neighbour who rescued a baby gull fallen off from a nearby roof. The weather hasn’t been quite wet and windy lately. 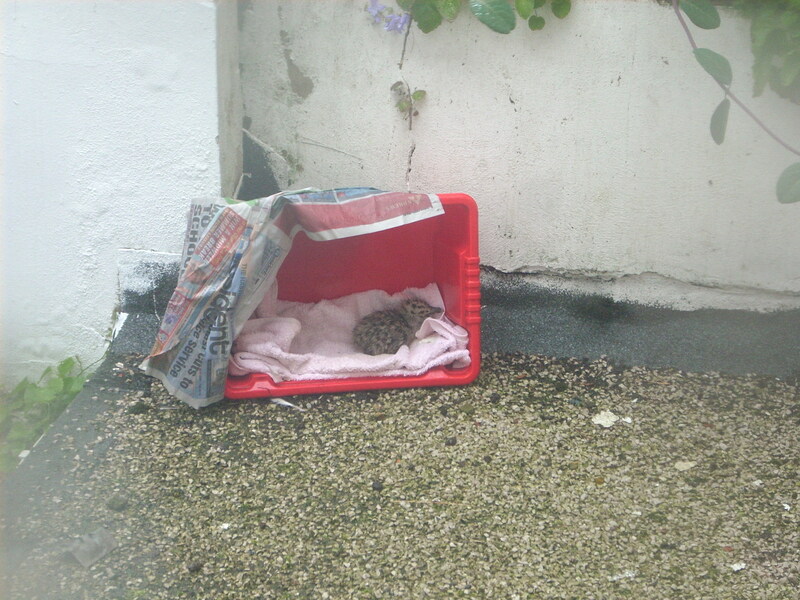 Our neighbour looked after the baby gull by putting temporary shelter onto the nearby roof. The baby gull will go to the RSPCA’s nearby wildlife centre, Mallydams, for care and hopefully eventual return to the wild. This entry was posted in The Grumpy Vegan Life and tagged Living the Grumpy Vegan Life, Wildlife. Bookmark the permalink.